The Luggin capillary in a laboratory cell is made from glass or plastic. It is generally filled with the test solution. The Luggin holds the reference electrode. The tip of the Luggin capillary near the working electrode is open to the test solution. The reference electrode senses the solution potential at this open tip. Note that the Luggin tip is significantly smaller than the reference electrode itself. The Luggin capillary allows sensing of the solution potential close to the working electrode without the adverse effects that occur when the large reference electrode is placed near the working electrode. 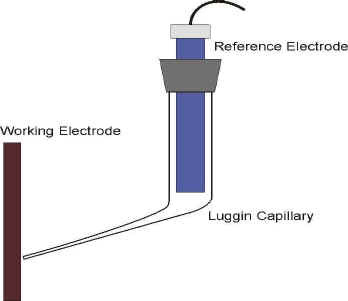 A luggin capillary can be used to bring the potential measuring point in close proximity to a working electrode under investigation. Such a device can be made of any material provided it is inert to the electrolytic environment. It basically consists of a bent tube with a large enough opening to accommodate a reference electrode and a usually much smaller opening only large enough to insure diffusional movement of the electrolyte. The device minimizes any iR drop in the electrolyte associated with the passage of current in an electrochemical cell.